Two simple, inexpensive devices allow tracing and testing fibers for continuity or proper connections and one even is used to optimize splices or prepolished/splice connectors. Many of the problems in connection of fiber optic networks are related to making proper connections. Since the light used in systems is invisible infrared light (IR) beyond the range of the human eye, one cannot see the system transmitter light. By injecting the light from a visible source, such as a LED, laser or incandescent bulb, one can visually trace the fiber from transmitter to receiver to ensure correct orientation and check continuity besides. 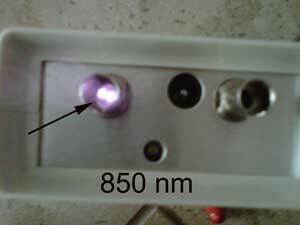 The simple instruments that inject visible light are called fiber tracers or visual fault locators. And in the end we will show you how to use an old cell phone's camera to detect light in a fiber optic system. 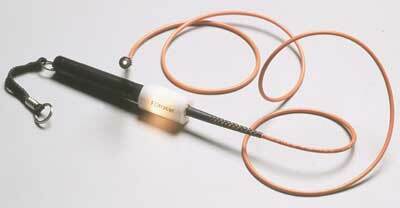 The fiber optic tracer is a low power visible light fiber optic tracing and troubleshooting tool for multimode optical fiber. It uses a bright incandescent bulb or visible LED source to inject enough light into the fiber to allow visual tracing of fibers, finding splices, and performing continuity checks. With the low power output of the fiber optic tracer there is no danger to the eye. Most tracers accomodate standard fiber optic connectors or can be used to check unterminated fibers with a bare fiber adapter. Continuity testing is useful to test a few fibers in a cable before installation or to determine if a terminated cable has been damaged.To test for continuity, attach the fiber to the fiber optic tracer or VFL. If light is visible at the far end, the fiber is not damaged. One of the best uses for these devices is to trace fibers for identification or to determine correct connections. To trace fibers using the fiber optic tracer or VFL, connect the fiber to the output connector of the unit. 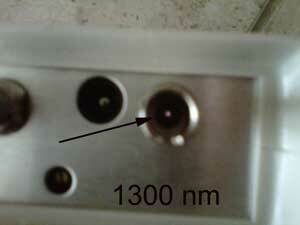 The light output will be visible to the eye at the other end of the fiber. This allows finding particular fibers in multifiber cables easily for proper connections during installation. If a powerful enough visible light ,such as a red HeNe laser or visible diode laser at 635-650 nm is injected into the fiber, high loss points can be made visible. Most applications center around short cables such as used in telco central offices to connect to the fiber optic trunk cables. However, since it covers the range where OTDRs are not useful because of the dead zone of the OTDR, it is complementary to the OTDR in cable troubleshooting. This method will work on buffered fiber and even jacketed single fiber cable if the jacket is not opaque to the visible light. 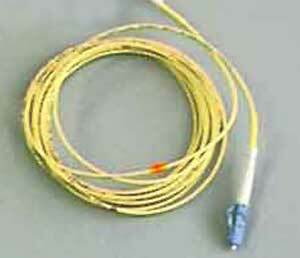 The yellow jacket of singlemode fiber and orange of multimode fiber will usually pass the visible light. Most other colors, especially black and gray, will not work with this technique, nor will most multifiber cables. 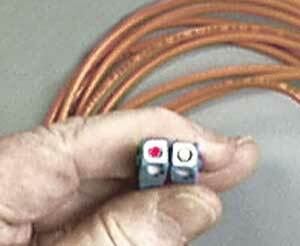 However, many cable breaks, macrobending losses caused by kinks in the fiber , bad patchcords, spices etc. can be detected visually. Since the loss in the fiber is quite high at visible wavelengths, on the order of 9-15 dB/km, this instrument has a short range, typically 3-5 km. 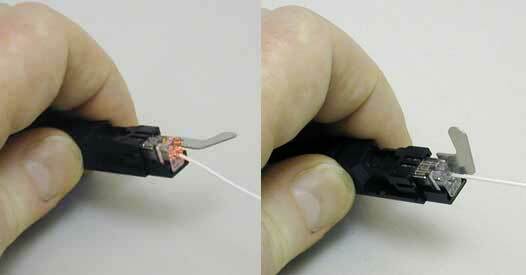 The visible laser cable fault locator also allows optimizing splices and tracing fibers. It is safe for use, classified as a Class II laser and having power levels low enough to prevent harm to the eyes, but powerful enough to trace singlemode fibers for 4 km or more. The higher power of a visual fault locator can find breaks in fibers or high losses around connectors in simplex cables. The light that escapes at a break, for example, will be visible through the jacket of the cable as shown below. This is extremely helpful in finding cable faults near the end of a cable where the dead zone of the OTDR makes it impossible to resolve faults. 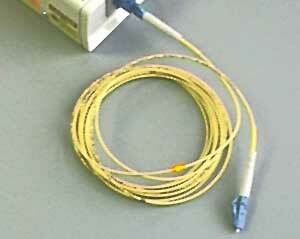 It also allows finding cracked fibers or bad splices in splice closures where an OTDR cannot resolve faults. Optical splices, especially the mechanical type, will often be visible when light from the FOtracer is being transmitted through the fiber. If the splice is close to the connector, such as when a pigtail is spliced to a cable, there is enough light to allow optimizing the splice. Adjust the positioning and/or rotation of the splices until the light from the splice is minimized, indicating maximum transmission or minimum loss. Optimizing prepolished connectors (high loss at left, optimized at right. Optimizing mechanical splices (high loss at left, optimized at right. The camera in your cell phone is sensitive to infrared light - lots more than your eye - and can detect light in an optical fiber or from a transmitter. Camera phones sensors are very sensitive at 850 nm but less so at 1300 nm, like all semiconductor detectors. This phone could still see 1300 nm sources at around -20 dBm, making it very useful even for LED sources, and of course, perfect for lasers. Our experience is that earlier cell phone cameras are better than new ones which are optimized for photography. We recommend you dig out that old cell phone from 2000-2005 and try it. If you don't have a fiber system or test source available, try the IR remote to your television to see the camera's sensitivity. We keep one of these old cell phones in our toolbox!